What are the rules concerning magnetic poles? How can you make a magnet without electricity? What is the difference between permanent and temporary magnets? You might ask the question 'what is magnetism', the answer is the same for gravity, nobody is really quite sure and the answer will lie somewhere in some deep quantum theory, well above GCSE physics level and my little grey cells! However, the causes and effects of magnetic fields are well understood and can be described by 'working models' e.g. little atomic magnets to do with electrons in atoms like iron, magnetic fields from compass plotting and accurate mathematical models from very simple equations to the extremely complex! Only relatively few materials display magnetic properties - that is, they are naturally magnetic, or more usually, capable of being magnetised. Typical magnetic materials are iron and its alloys like steel, nickel and its alloys and cobalt and its alloys - the alloys, in particular, are used to produce very strong permanent magnets. Other common structural metals like aluminium, copper and lead are not magnetic. Jewellery metals like gold, platinum and silver are also not magnetic. Actually most materials are NOT magnetic! A bar or rod of magnetic material can be shown to have two poles, one at each end - a north seeking pole (north) and a south seeking pole (south). As with electric charges, when you bring poles together, one of two things can happen. Either the poles attract or they repel each other. In other words any two magnetic objects exert a force on each other - attraction or repulsion. The rule is quite simply unlike poles attract (N => <= S) and like poles repel (<= N N => or <= S S =>). You can easily demonstrate these rules with two bar magnets (of known polarity) suspend on string and bringing the various ends together (as in diagram above). Previously magnetised materials will attract other magnetic materials whether they were or were not, already magnetised. e.g. a magnet will always and readily attract an item of iron or steel. In other words when a magnet is placed near a magnetic material the two objects always experience an attractive force - it doesn't matter which pole of the magnet is placed nearest the object - see induction later. A magnetic force is a non-contact force, even if the objects eventually touch. Electrical and gravitational forces are also non-contact forces. All, already magnetised materials are surrounded by a magnetic field, which we will look at in detail next. You can map out the magnet field around a bar magnet by using a small plotting compass. represent compass plotting positions on the diagram below (N=>S). The magnetic field lines should indicate that the 'magnetic flux' runs from the north pole to the south pole. Inside the plotting compass a tiny bar magnet (compass needle) aligns itself so that its north pole is attracted to the south pole of the magnet it is near. The same thing happens with a navigation compass, which aligns itself with the Earth's magnetic field. Your plotting compass does same thing when well away from the magnet - which shows the Earth creates a magnetic field - because the Earth has an iron core and this swirling mass of mainly molten iron generates a magnetic field. You carefully select a starting point close to a pole and move the plotting compass around, making a dot adjacent to each end of the compass needle. Gradually a line a force can be drawn by joining up the points. You just repeat the procedure from a different starting point by a pole. The results of plotting a magnetic field around a permanent bar magnet. By convention, the lines of force run around from the north pole to the south pole. The lines of force show which way a force would act on a north pole if it was placed at that point in the field - see how the compass needle aligns itself along the line of force. The closer the lines of force are together, the stronger the magnetic field. The lines of force are closer together nearest the poles - this means the strength of the magnetic field is strongest close to the poles. The further you get away from a magnet, the weaker the magnetic field. The strength of the magnetic field is called the magnetic flux density and is measured in teslas (T). Diagrams A and B shows the magnetic field around a permanent bar magnet. How to plot this was described above with the lines of force running from north to south. You can clearly show this pattern using iron filings. You place a permanent bar magnet under a sheet of paper or plastic. You then sprinkle iron filings randomly on top of the sheet. Then, tap the sheet gently and repeatedly until the pattern of the magnetic field emerges. The permanent magnet induces magnetism in the iron filings and converts them into temporary magnets which all line up - N - S - N - S - etc. along the lines of force of the magnetic flux. Its quicker than doing the compass plot method, but you don't end up with a plot unless you photograph it! Diagram C shows the magnetic field when opposite poles of two bar permanent bar magnets are brought close together and attracted. When a N-S or S-N attraction happens the lines of force join up from one magnet to another in a uniform pattern and the lines of force still run from a north pole to a south pole. Diagrams D and E show when like poles of two permanent magnets are brought close together and repulsion takes place. In this case the lines of force do NOT join together from one magnet to the other, but they still run from a north pole to a south pole. There are two types of magnet we need to consider. Permanent magnets retain their magnetism and create their own magnetic field. Induced or temporary magnets are materials that only become magnetic when placed in a magnetic field and will only then produce their own magnetic field. Temporary magnets are made from soft magnetic materials like iron and some iron-nickel (steel) alloys. For example when a permanent magnet is placed in contact with another magnetic material like iron, they will always be attracted to each other AND a north and south pole are induced in the other magnetic material. e.g. If you place a permanent steel magnet in contact with a piece of iron, the piece of iron becomes magnetised and the two induced poles match the S-N attraction. In fact, the nearest pole on the iron to the magnet will always be the opposite of the pole on the permanent magnet, hence the attraction. In other words a permanent north pole induces a temporary south pole in the magnetised material or permanent north pole induces a temporary south pole. This explains why a permanent magnet can pick up any other magnetisable material - it induces the opposite poles and attraction immediately follows. In the case of iron, when you remove the permanent magnet you remove the source of induced magnetism and the iron bar gradually loses its magnetism. The iron bar would be described as a temporary magnet and the iron as a soft magnetic material. This magnetic pole induction produces some quite interesting effects! e.g. a bar magnet will pick up a whole chain of iron nails or paper clips as each iron/steel item becomes an induced magnet and can so attract another one. The magnetic field effect becomes weaker down the chain and eventually the weight of the chain becomes greater than the force of the magnetic field and either no more 'stick on' or the whole lot fall off. You can use the principle of induction to make a permanent magnet from another permanent magnet. All you have to do is stroke the un-magnetised steel bar with a permanent bar magnet. You repeatedly stroke the steel bar with the magnet repeatedly in the same direction. All the 'atomic iron magnets' all line up to produce a permanent magnet with its own independent magnetic field - its still magnetic induction, but the effect is permanent. 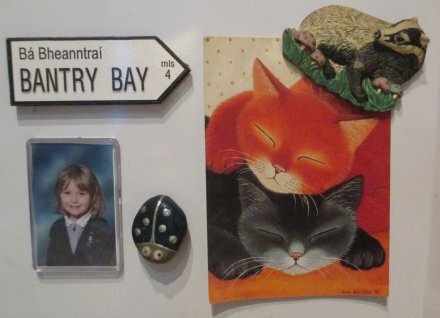 Sticking things on the refrigerator! Magnetic screwdrivers help hold the screw in position in hard to reach places. Jewellery clasps can be made of permanent magnetic materials. A compass works by the alignment of its needle with the Earth's magnetic field. The north pole is actually the south pole of the Earth's magnetic field. Therefore the magnetic north pole of the compass points geographically north to the south magnetic pole of the Earth's magnetic field. Therefore the Earth's magnetic north pole is at the geographical south pole. The magnetic north is a few degrees away from the true geographic north pole based on the Earth's spin axis. The fact that a magnetic compass always aligns itself in a particular direction is proof that the Earth has a magnetic field. 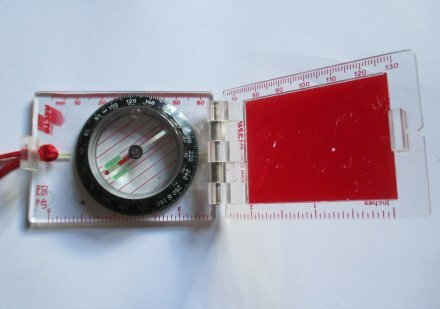 The trusty compass to help you navigate the countryside with your OS map. However, these days, many walkers are using GPS systems for navigation, but I still like a 'real map' and a 'real compass'!